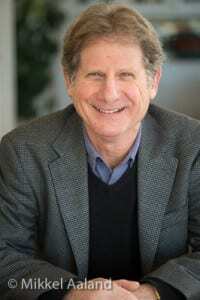 Travel writer and award-winning author Perry Garfinkel returns to Bainbridge Island by popular demand to teach another travel writing workshop following his 2015 sold out travel writing workshop. The topic this time will be memoir writing — as distinct from last year’s focus on travel journals and travel articles for publication. This year, Perry’s workshop will again incorporate hands-on, indoor/outdoor practical writing exercises, with a field trip and fun lessons. Join other writers, aspiring writers, and people who love to travel (and write about it) for a full weekend from Friday through Sunday. Because Perry’s workshop was so popular last year, and so fully subscribed, he has agreed to come early and give a separate additional talk. 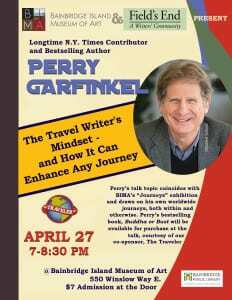 On Wednesday, April 27th from 7-8:30 pm in the auditorium of the Bainbridge Island Museum of Art (BIMA), the topic will be “The Travel Writer’s Mindset – and How it Can Enhance Any Journey.” Perry’s topic coincides with the art museum’s “Journeys” exhibition and draws on his own worldwide journeys, both to global destinations and within. Garfinkel is a published travel writer and contributor to the New York Times, Wall St. Journal Asia, Huffington Post blog, and numerous national and international magazines. He is the bestselling author of “Buddha or Bust“, which was selected by Shambhala Press for Best Buddhist Writing of 2007. Perry’s book “Travel Writing for Profit and Pleasure”, published in 1989, was called “the definitive work in its field” by travel guide guru Arthur Frommer. Learn more at Perry Garfinkel’s website. As explained in this podcast by Jennifer Hager of Field’s End, the travel memoir writing workshop will begin on the afternoon of Friday, April 29th, and includes an informal reception that evening at Fletcher Bay Winery in the Coppertops. 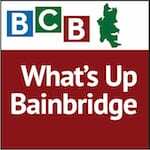 It continues at Bainbridge Island Museum of Art all day Saturday, and then through 2pm on Sunday. The fee charged by nonprofit writers’ group Field’s End will include boxed lunches on Saturday and Sunday from the art museum bistro. Registration is online at Field’s End website. Space is limited to 15 participants.